Jennifer Cluff: Galway on Moyse, Nagahara flutes etc. Galway on Moyse, Nagahara flutes etc. See and hear Sir James Galway speak from his Weggis Masterclass 2009. 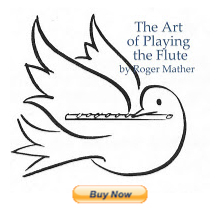 Galway speaks about Marcel Moyse's playing and teaching, about Nagahara flutes, Brogger mechanism, and also touches upon several topics of interest (single tonguing, practising Moyse's technique books, buying a new flute etc). Note 2017: Link no longer works. Try looking on youtube for Weggis which is the name of the masterclasses Galway gives in the summer. This is a great video! And very surprising as well. I play a Brannen with a Brogger mechanic, and it is the fastest mechanic I've ever tried. But I've never tried the Nagahara flutes. I'm interested now. I've going down to Boston after the convention to try the new La Fin headjoints at Brannen. I've played them once before and was very impressed. I have a Nagahara headjoint, and an Altus body. I've never tried a Nagahara body, however.